WHAT: The presence of antiwar activists today at the Pentagon follows the International Day of Peace, the over 700 actions of nonviolence around the US and other countries organized by Campaign Nonviolence calling for an end to war, poverty, and for serious efforts to address the climate crisis and environmental degradation. In addition, many of the activists had attended the World Beyond War conference held in Washington, DC at American University over the weekend entitled “No War 2016: Real Security Without Terrorism”. The attempted meeting by activists was a continuation of the over 700 events organized by Campaign Nonviolence this month in addition to carrying the message of World Beyond War to the Department of Defense and Obama Administration. The activists tried to also deliver a petition signed by over 23000 people to President Obama, Secretary Carter, and German Chancellor Merkel calling for the closing of a drone relay station at US Air Force Base Ramstein in Germany which has been linked to the deaths of innocent civilians. Activists in Germany also attempted to deliver this petition to Merkel today. Australian activists acted in solidarity at the US military base in Pine Gap and another solidary action was held at West Point, NY by others concerned about the US drone program. What happened this year (2016) for the International Day of Peace? WHY: Rev. Janice Sevre-Duszynska one of those arrested explained why she was at the Pentagon seeking a meeting today “The measure of a healthy society is how we treat the marginalized. How we can care for them in a just and humane manner when 56% of the federal budget goes to the Pentagon for its 800+ military bases and the killing? 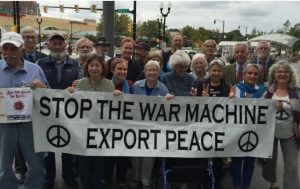 That fills the pockets of the weapons manufacturers!” The World Beyond War conference and Campaign Nonviolence say there is a link between poverty, war, and the environmental threat to the planet. They say that there needs to be a new way of running our planet and resolving international conflict through nonviolence. “The reason why I took action today is because I am moved by conscience by the words of the late peace activist Daniel Berrigan who said “Because we want the peace with half a heart and half a life and will, the war, of course, continues, because the waging of war, by its nature, is total – but the waging of peace, by our own cowardice, is partial.” We all need to get out of our comfort zone and away from what is convenient for us when it comes to taking action. We cannot continue on the path of more war while so many social problems exist in society. War is a threat to Mother Earth and all humanity. The way of war is not sustainable” Kilbride said. The USA is on a path of global destruction. The USA is playing into the hands and plans of International Terrorists, continuing to kill civilians, children the elderly with drones that are impossible to control. They have no idea who is really in the targeted buildings around the world. Every innocent person killed by “accident” creates 10 new terrorists. When will the carnage stop? The USA has become a Nation of criminals, killing off each other, innocent Americans, and unintended foreign victims. IS THIS REALLY WHO WE ARE???? ?